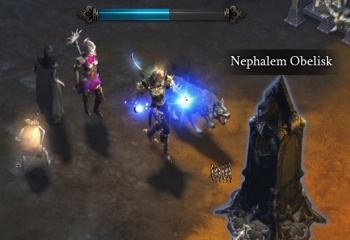 Difference between revisions of "Nephalem Rifts"
Nephalem Rifts are highly-randomized content, and are intended to be the most rewarding[http://diablo.incgamers.com/blog/comments/travis-day-weighs-travis-day-weighs-in-on-reaper-of-souls-legendary-item-drop-rates][http://diablo.incgamers.com/blog/comments/blizzard-explains-the-25-legendary-drop-rate-in-nephalem-rifts][http://diablo.incgamers.com/blog/comments/huge-legendary-drop-rate-buffs-coming-rifts-gambling] (in terms of item gains) style of play in Reaper of Souls/. Rifts are mini-dungeons with from 1-10 levels. They are completely random in tilesets and monsters, and can offer combinations of levels and monsters that will never be seen elsewhere in the game. 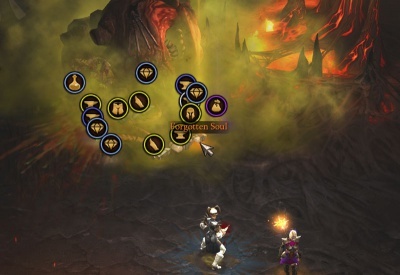 Rifts debuted publicly in the Blizzcon 2013 gameplay demo, with the entire Adventure Mode game system available, including Bounties and Rifts. Nephalem Rifts are highly-randomized content, and are intended to be the most rewarding (in terms of item gains) style of play in Reaper of Souls/. Rifts are mini-dungeons with from 1-10 levels. They are completely random in tilesets and monsters, and can offer combinations of levels and monsters that will never be seen elsewhere in the game. Nephalem Rifts will be expanded upon by the Greater Rifts, coming in Patch 2.1, Reaper of Souls' first major content patch, due in Summer 2014. Greater Rifts are timed Nephalem Rifts with a new scaling difficulty system and greater rewards for players who are geared well enough to clear them in the time allowed. See the Greater Rifts article for full details. There are advantages and disadvantages to running Nephalem Rifts, rather than Bounties in Reaper of Souls Adventure Mode. Rifts have the highest legendary drop rate in the game. Rift Guardians can drop Forgotten Soul materials. Rifts can rarely spawn Treasure Goblin packs of 8-12 in a bunch, as well as the ultra-rare Reaper of Souls Infernal Bovine Easter Egg level. Completing a Rift grants an EXP/Gold bonus equivalent to a large reward Bounty. Rifts require 1 keystone from each character to open, which must be farmed via Bounties. (Rifts required 5 keys prior to Patch 2.1. Rifts have no side events, mini-quests, or Cursed Chests, all of which are worth substantial EXP, gold, and items. There are no random Uniques in Rifts, other than the Rift Guardian, hence they offer few chances to score legendary materials. (Leg mats were removed in Patch 2.0.6. The fact that Rifts are randomized is a pro and a con, since it makes them unpredictable. Some rifts have high monster concentrations and lots of Elites and are hugely-profitable. Others may be much sparser in monsters, with few Elites, and thus take longer and provide less rewards. Such is RNG. (Some of the least-productive rift tilesets, including the Pandemonium Fortress layout, were removed in Patch 2.0.5. Rifts are meant to be a quick, intense game mode with variety and unpredictability keeping the content fresh. Rifts generally take 10-20 minutes to clear, depending on the number of players and their strength relative to the difficulty level, and there are Achievements for completing in less than 10, 5, and 2 minutes. An unlimited number of Rifts can be run in the same game, providing players have enough Rift Keystones to keep opening up a new Rift after completing the previous one. During the Reaper of Souls beta it was possible to abandon a Rift and open a new one, but that option is gone in the live game and a new Rift can only be opened once the Rift Guardian has been slain. 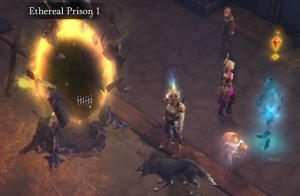 Early in RoS that required just one character in the game to click on Orek, but after player complaints about Rifts closing before all the loot could be gathered, Blizzard added a thirty-second timer. That delay is not enough for some players and there are many requests for longer timer, or for every player in the game having the option to veto the Rift ending. The issue is complicated by the substantial EXP/Gold reward for completing a Rift, which players can not retrieve until they finish the Rift and tell Orek to shut it down. Rift completion award and 30s countdown timer. One Rift Keystone is required from each character who wishes to enter a Rift. (Five keys required prior to Patch 2.1.) Rift Keys are granted for completing bounties and are also found in bounty bags (Horadric Caches). Prior to Patch 2.10 it was much more efficient to run Bounties and/or Rifts in groups, since each Bounty and Bounty Bag rewarded all characters who took part with 1 or more Rift Keystone(s), and only one player needed to spend 5 Rift Keystones to open a Rift, which all players in the game could enter. Thus four players working together to clear an Act of Bounties would get 5-7 rift keys each; enough to do four Rifts, while a solo player will only get enough for one. In Patch 2.1 and later each player entering the Rift requires a keystone, which makes it much easier for a solo player to rift, but doesn't lower the total cost much for multiplayer games; 4 rift keys for 4 players, vs. 5 for any number of players previously. Clicking the Nephalem Obelisk in town starts a five second loading bar (added in Patch 2.0.4), and then the Altar opens up to reveal a yellow portal that can be entered by all players in the game. In a Rift players must kill approximately 500 monsters to complete the progress bar to 100%. At that point a Rift Guardian will spawn nearby, and when defeated will drop a huge fountain of items, gems, materials, and a large stack of Blood Shards (20+ shards, increasing by difficulty level). Once the Guardian is killed the Rift can be closed or ended by speaking to the NPC Orek who stands near the Nephalem Altar in town. When any player clicks on him after the Guardian is dead, Orek will give all players in the game a substantial bonus to Exp and gold, and start a 30 second countdown to ending that Rift. Entering a Greater Rift will require a special Greater Rift Keystone, which can only be earned by killing normal Rift Guardians. Every player who wants to enter the rift must have such a greater keystone, unlike the normal Nephalem Rifts which only require keystones from the player who opens the rift and then let anyone else in the game enter for free. Shortly after Reaper of Souls' release, Blizzard announced a +25% drop rate bonus for legendary items in Rifts. This bonus was multiplicative, increasing in efficacy with each difficulty level, and the drop stats were as follows. Normal: 0% Legendary drop bonus, 25% bonus in Nephalem Rifts. Hard: 0% Legendary drop bonus, 25% bonus in Nephalem Rifts. Expert: 0% Legendary drop bonus, 25% bonus in Nephalem Rifts. Master: 0% Legendary drop bonus, 25% bonus in Nephalem Rifts. Torment 1: +15% Legendary drop bonus, +44% bonus in Nephalem Rifts. Torment 2: +32% Legendary drop bonus, +65% bonus in Nephalem Rifts. Torment 3: +52% Legendary drop bonus, +90% bonus in Nephalem Rifts. Torment 4: +75% Legendary drop bonus, +119% bonus in Nephalem Rifts. 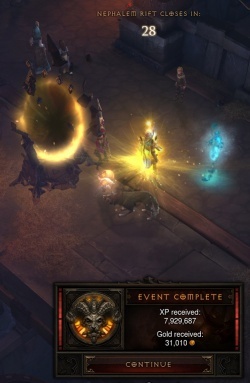 Torment 5: +101% Legendary drop bonus, +151% bonus in Nephalem Rifts. Torment 6: +131% Legendary drop bonus, +189% bonus in Nephalem Rifts. That was not deemed a large enough bonus, and just a few days later designer Travis Day announced that Nephalem Rifts were going to get a 100% drop rate bonus, up from the 25% bonus. Rifts have always been intended to be the most efficient play method in the game, currently they aren’t for a number of reasons. Part of this has to do with the high level of efficiency in farming that players find doing things like farming Manglemaw, Razorclaw and any other number of unique monsters. Another contributing element is that farming chests without having to actually fight monsters is far more effective than actually fighting the monsters. It is very important to us that chests are exciting to find and feel rewarding but presently they are far too common and reliable to farm in certain areas of the game. The bonus legendary drop rate for rifts is being increased from 25% to 100%! Soon after this, hotfixes went live that nerfed the drop rates of various Uniques (like Manglemaw and Razorclaw), while implementing the Nephalem Rift drop rate boost. This did indeed make Rifts the most profitable source of Legendary item drops, especially on higher difficulties. Rift Guardians unleash special attacks when near death. Tiered Rifts are coming in Reaper of Souls content patch in mid-2014. They were first detailed by Wyatt Cheng from the Reaper of Souls launch party. Q: Are there plans to add new end-game challenges in the months to come, similar to the Infernal Machine event? Wyatt Cheng: New end game challenges... Josh mentioned that the first content patch is going to have Seasons. I'm happy to announce that there is another major feature coming in the patch 2.1, which is going to be what we're internally calling Tiered Rifts. The idea behind that is an actual challenge scenario, where players do increasingly hard Rifts, to try and see who can get the farthest. The basic mechanics that we have working right now is: you go through the game in Adventure Mode, you do your Bounties, you do a Nephalem Rift. If you clear the Nephalem Rift, there's a chance to get what's called a Greater Rift Token. If you successfully clear the Greater Rift in a certain time limit, then you unlock a Greater Rift Key (Rank 2). If you clear that one, you get Rank 3, etc. Each one is harder than the previous one. Much like Seasons, we're looking at having a leaderboard as well, so you'll be able to compare your progress to the people on your Friends List, your Clan, and the whole region. You'll be able to see who got to the highest Tiered Rift, and what time were they able to obtain on that. These sound like a combination of their abandoned plans for Nephalem Trials, crossed with the various fan-requested details of bottomless dungeons. Two new game modes -- Loot Runs and Nephalem Trials -- are being added as well, providing fun and rewarding challenges for players to tackle when they’re not busy saving the world. This changed during development when Loot Runs became Nephalem Rifts, and grew much more involved/complicated in structure, and wedded tightly to the whole Adventure Mode gameplay option. Several screenshots showing off what appeared to be Nephalem Rifts were included in the Gamescom 2013 press kit. These showed dungeon tile sets known from Acts 1, 2, and 3, but all have monster types that are never found in those areas in D3C, and that sort of randomized variety is what Nephalem Rifts are said to feature. Act One dungeons with Fallen Angel enemies. Act Two ZK's dungeons with new Act 5 skeletons. Act Three dungeon with new Act 5 skeleton types. The following was datamined in 2013, when Reaper of Souls was still in early production and Nephalem Rifts were still called "Loot Runs." The feature changed greatly before release, but it's interesting to see how the early planning was taking shape. LootRunKey - Bring this to Zoltun Kulle and he will open a portal to a Loot Run. The data strings on Loot Runs are incomplete, but they give indications of the content. LootRunBar - You have started a Loot Run! Kill enemies to fill this bar. When it is full, a portal will open to the Loot Run guardian. LootRunBarComplete - You have opened a portal to the Loot Run guardian! Enter the portal and defeat it! LootRunComplete - You finished your first Loot Run! When you find additional Portal Keystones, take them to Zoltun Kulle to open new Loot Runs. LootRunItemPickedUp - You have found a Portal Keystone! Take it to Zoltun Kulle to open a Loot Run. Line0 - Finish what you're doing now, then I'll open another portal for you. Line0 - Be patient. I cannot open another portal for you until the raid guardian is defeated and everyone has returned. Loot Runs sound much like the Infernal Machine portals, in that only one can be active at at time and another one can not be opened until the previous one has been defeated. Rift Guardian achievement, from the Beta. Rift Guardian Blighter with his special poison attack. Rift Guardian Rime with his special cold attack. 60 Blood Shards dropped on Torment I.